Industry staple Powersports Business released their top pics in this year’s Nifty Fifty awards. Each year, hundreds of brands submit their newest innovative products in hopes of winning one of the coveted spots. 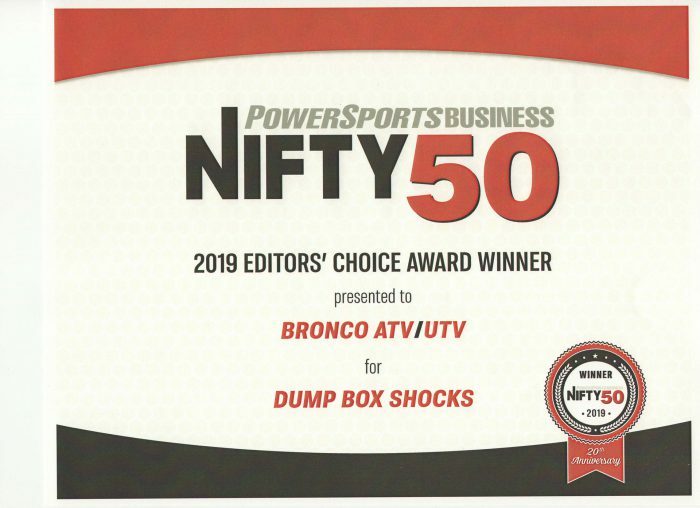 This year, Bronco ATV & UTV Components was fortunate enough to receive a selection for our industry-first full line of replacement UTV dump box shocks. In addition to being built to oem spec for a quick and easy installation, all of our dump box shocks come equipped with black nitrogen coated shafts and reinforced eyelets (where applicable) which has undoubtedly been the primary issue with the oem design. Bronco has always strived to look for innovative ways to keep our customers enjoying their ATVs and UTVs whatever their use and riding style. We are very excited about this new line and look forward to dealers receiving them in the coming months. © 2019, BroncoATV Technologies. All rights reserved.